This is a great time for those of us who love comics. Almost every genre is hitting creative high points, be it super heroes, horror or alternative humor. Yet even with so many great choices available something can come along so astonishing and unexpected that you can’t help but be in complete awe of it. A comic has done this to me today and that comic is the recently released first issue of “Cursed Pirate Girl” by Jeremy Bastian. The story is set in 1728 in a Jamacian sea port ruled by the pompous Governer Maygun. His young daughter Apollonia has an adventureous spirit, but is constantly stifled by her uptight father. Her life brightens when she meets an older child who identifies herself only as the Cursed Pirate Girl. This free-spirited girl lives alone under a wharf on the beach and claims to be cursed by a sea witch for the killing of her boar-headed son. As the story unfolds we learn that the Cursed Pirate Girl’s tremendous imagination may not be so imaginary after all. The characters (particularly the two girls) are incredibly vibrant and bursting with life. The dialogue is sharp and witty, perfectly serving the opening chapter of a story rich with the possibility of becoming a top notch example, and future classic, of fantastical adventure. Still, given all this, the first thing everyone is guaranteed to mention about “Cursed Pirate Girl” is the jaw-dropping black and white art. The incredible, immensely detailed images that threathen to overflow every page are, in a strictly artistic sense, far beyond almost everything else being published in the medium today. Bastian’s precise draftsmanship and shifting panel layouts reminds one of everything from Gary Gianni and Tony Millionaire to “Little Nemo In Slumberland” and the early political cartoonist Thomas Nast. This level of obsessive detail yelids surprises that will continue to reward repeat viewings, from crowded street scenes where no two figures are even nearly alike, to hidden faces and skulls found in the crevices of rocks and ocean waves. “Cursed Pirate Girl” is easily the best comic I’ve read so far this year, but you don’t have to take my word for it. Here’s Mike Mignola’s quote from the comic’s back cover: “It’s all too rare that I see work that is truly original – and I never see work THIS original. Jeremy Bastian is a genius.” Amen to that Mr. Mignola. 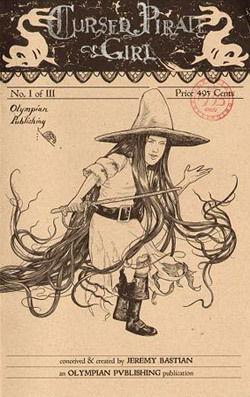 The first issue (of three) of “Cursed Pirate Girl” is currently available and is published by Olympian Publishing.